Zensible Mama: DW - Girls Rules! What's wrong with this little boy? Being Shy or needs to go wee wee? Poor kid. I don't blame him. Mr. Linky will not be here today but maybe next Wednesday...or until there's enough players to make sense putting him up. Cross fingers and toes. If you're playing today, please let me know so I can come visit yours too! To RSVP for next week, just leave a comment. Thank you!!! oooh id love a feng shui reading!!! pick me pick me!!! cute set of pics!!! happy hump day - dont forget my superawesome giveaway!!! only nine posts left!!!! I don't blame him a bit! 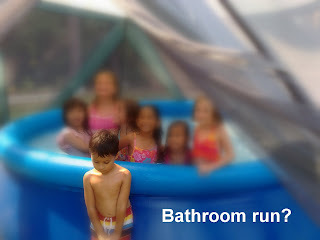 Cute picture, poor little boy having to swim with all those girls. I posted my Decode picture, thank you for organizing this. Happy Wednesday. Now that is too funny! 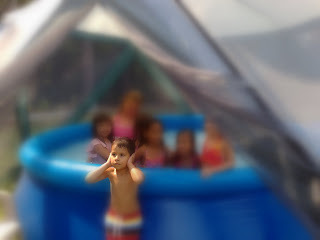 Some day he'll dream of being surrounded by girls in bathing suits. LOL! Did you get my email with my address? I sent it a couple days ago. THanks again by the way! I wanted to be sure to stop by and THANK YOU for my package! I received it yesterday afternoon and love it! I'll post about it this weekend. Thank you again. So sweet of you to do that!